Charley, 27-foot skeletal yacht frame, created by Mark Aeling. There’s more to see than just the Hillsborough River during your jaunt down the Tampa Riverwalk. While you might see some kayaks, rowboats or electric boats floating on the river, you’ll find only one boat-as-public-sculpture greeting walkers at the entrance of NOVEL Riverwalk -- a developing apartment complex run by Crescent Communities, who commissioned this project. This 27-foot skeletal yacht frame, with bow sticking upright in the air proudly, has been dubbed "Charley'' by its creator Mark Aeling of MGA Sculpture Studio in St. Pete. Charley Morgan of Morgan Yachts is a bit of a boat genius, having designed and built over 10,000 yachts through his lifetime; he’s 88 years old and has only just retired a few years back. As a self-taught engineer, Charley has led an exciting life from an early age: When he was 17, he entered a boating race that went from St. Pete to Cuba. He had to have special permission to race because the boat that he built in his own backyard didn’t have a motor. This ended up launching his career in becoming a specialist in hull design. "Charley even helped consult on the structural engineering of the sculpture itself because the aluminum needs to sustain hurricane winds,'' Aeling adds. Using the famous racing yacht "Heritage'' as inspiration, it took 4 months from concept to completion before it was installed in late March across from the Tampa Bay Times building near The Straz. 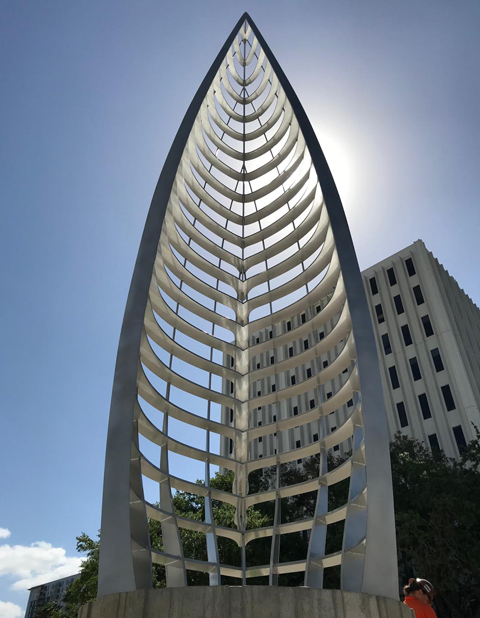 It has similar aesthetics as MGA Sculpture Studio’s “Budding Vortex” sculpture that was also commissioned by Crescent Communities back in 2016 at the entrance of one of their communities on North Lois Ave.; they both have a kinetic sculpture quality with their blade-like construction.